The vendor landscape of the East Africa baby diapers market features a largely consolidated nature, with leading companies such as Indevco Group, Procter and Gamble, Interconsumer Products Ltd., Johnson & Johnson, Unicharm Corporation, and SCA Hygiene accounting for a large share in the overall market revenue. Procter and Gamble accounted for nearly 22% of the Kenya baby diapers market, which holds the largest share in the entire East Africa baby diapers market, in 2015. As most countries in the region fall in the developing category, product cost is an important determinant of growth for companies operating in the East Africa diaper market. Owing to this, companies have chiefly adopted strategies to cut down the final cost of products and are seen favoring their own distribution agents as compared to third party sellers. Resources are also being ploughed into the research and development of environment-friendly products so as to appeal to a rising consumer base of environmentally conscious parents. 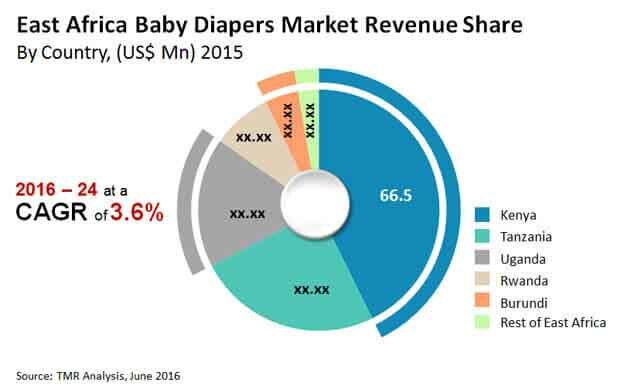 According to the report, the East Africa baby diapers market will rise to a revenue valuation of US$218.7 mn by 2024, exhibiting a 3.6% CAGR from 2016 to 2024. In terms of volume, the market is expected to rise to market size of 9.58 mn units by 2024, registering a CAGR of 3.2% over the forecast period. In terms of the variety of baby diapers available in the East Africa market, the segment of disposable diapers presently accounts for a lion’s share of the market; the segment held more than 80% of the overall market in 2015 and is slated to remain the top-selling diaper variety over the report’s forecast period owing to convenience of use and disposable and availability of several options in terms of cost range, brands, and product quality. From a geographical standpoint, the market in Kenya accounted for over 42% of the overall East Africa baby diapers market in 2015. A notable decline in rates of infant mortality has been seen in East African countries in the past few years. In Uganda and Kenya, for instance, infant mortality rates have declined from 41.6 to 37.7 and from 38 to 35.5 per 1,000 births, respectively. Other East African countries such as Burundi, Rwanda, and Tanzania have also seen a notable decline in infant mortality. This factor, coupled with the steady rise in disposable incomes in the region have been significant for stimulating the overall demand for baby diapers in the region in the past few years. Another key factor to have worked for the East Africa baby diapers market is the vast rise in awareness, especially among the urban dwelling population in the region, regarding the use of baby diapers as a way of maintaining personal hygiene. Efforts by government bodies to educate people regarding the need for maintaining hygiene for the prevention of contraction and outbreak of infectious conditions has also worked well for the market over the years. However, concerns pertaining to certain health risks associated with the use of baby diapers, such as skin rashes and long-term risk of infertility and testicular cancer when disposable diapers are changed after long gaps, could hamper the growth prospects of the market to a certain degree.